The 180 years old iconic building (housed office of the Director General of Police, Tamil Nadu) was lit blue on 12-11-2016 in connection with World Diabetes Day and a Walkathon by MVH staff. 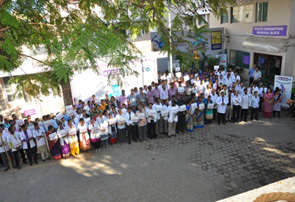 Staff of MVH taking a pledge on World Diabetes Day to control and prevent Diabetes. Dr.Vijay Viswanathan, Head & Chief Diabetologist, M.V.Hospital for Diabetes, Royapuram along with Diabetic Foot Patients at the release of Amputation Prevention Information for Public and Distribution of Free Foot Care Kit for Amputees. ​DIABETIC NEPHROPATHY UPDATE AND PROF. M. VISWANATHAN HONOUR AWARD-2016 ORGANIZED BY PROF. M. VISWANATHAN DIABETES RESEARCH CENTRE ROYAPURAM ON 11-09-2016. Dr.Luigi Gnudi, Professor, Diabetes & Metabolic Medicine, Kings College, London conferred with Prof. M. Viswanathan Honour Award with a citation and a bust. Dr. Vijay Viswanathan, Head & Chief Diabetologist, M.V.Hospital for Diabetes (right) and Dr. S.N. 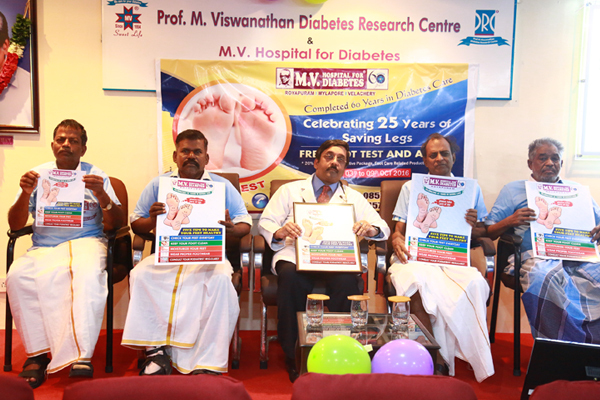 Narasinghan, Dean, Prof. M. Viswanathan Diabetes Research Centre (left) are also seen. Photo (left) students from Little Flower Convent School for Blind being honoured with a small donation for their studies by Dr. Vijay Viswanathan, Head & Chief Diabetlogist of the Institute and Photo (right) staff who have received gifts for completing more than 20 years of service at M.V.Hospital for Diabetes with Dr.Vijay Viswanathan and other senior staff of the Institute. According to the national ranking, regional ranking (South) and Chennai ranking, MVH has stood 1st in the above 3 categories by a survey conducted by the Times Group. 70th Independence Day Flag hoisting organized by M.V.Hospital for Diabetes, ROYAPURAM on 15th August, 2016. Thiru D. Jayakumar, Minister for Fisheries, Govt. of Tamil Nadu, honouring Karunalaya – centre for street and working children with a small donation on the occasion of 70th Independence Day organized by M.V.Hospital for Diabetes, ROYAPURAM. Dr.Vijay Viswanathan, Head & Chief Diabetologist of the Institute is also seen. 31 st EDITION OF PROF. M. VISWANATHAN GOLD MEDAL ORATION AWARD 2016 & CONFERRING LIFE TIME ACHIEVEMENT AWARD HELD ON SUNDAY, 19 TH JUNE, 2016 IN CHENNAI. Dr. S. Geethalakshmi, Vice Chancellor, The Tamil Nadu DR.M.G.R. Medical University addressing the gathering. From left to right, Dr. Vijay Viswanathan, Head & Chief Diabetologist, M.V.Hospital for Diabetes, Dr. Sunil D. Khaparde, Deputy Director General, Ministry of Health & Family Welfare, Government of India, [Head, Central TB Division] and Dr. S.N.Narasingan, Dean, Prof.M.V.DRC are also seen on the dais. ​AMERICAN DIABETES ASSOCIATION’S 76 TH SCIENTIFIC SESSIONS FROM FRIDAY, JUNE 10 THROUGH TUESDAY JUNE 14, 2016 IN NEW ORLEANS, LOUISIANA. ​An MoU signed between SRM Research Institute, SRM University and Prof. M. Viswanathan Diabetes Research Centre, Royapuram Chennai on 03-05-2016 focusing on 'advanced research'. ​His Excellency DR.K.Rosaiah, Governor of Tamil Nadu launched the Beat Diabetes programme​, adorned college students with special scarf for the Beat Diabetes Programme and released the Education Material at Chennai today (06/04/2016). DR.K.Rosaiah, His Excellency The Governor of Tamil Nadu launching the education material for 'Beat Diabetes Programme' Dr. Harish L.Metha, Chairman, Indian Red Cross Society, Dr. A. Muruganathan, Dean, Indian College of Physicians, Dr. Vijay Viswanathan, Chairman & Managing Director, M.V. Hospital for Diabetes and Dr. S.N.Narasingan, Dean, Prof. M. Viswanathan Diabetes Research Centre are also seen. A college student is being adorned with special scarf by DR.K.Rosaiah, His Excellency The Governor of Tamil Nadu. Dr. Harish L.Metha, Chairman, Indian Red Cross Society, Dr. A. Muruganathan, Dean, Indian College of Physicians, Dr. Vijay Viswanathan, Chairman & Managing Director, M.V. 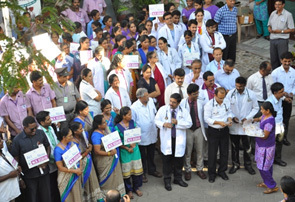 Hospital for Diabetes and Dr. S.N.Narasingan, Dean, Prof. M. Viswanathan Diabetes Research Centre are seen in the picture. COMPLETION OF PHASE – 1 OF CHENNAI SLIM AND FIT PROGRAMME IN CBSE SCHOOL ORGANIZED BY M.V.HOSPITAL FOR DIABETES AND PROF. M. VISWANATHAN DIABETES RESEARCH CENTRE AT A FUNCTION HELD IN CHENNAI ON 19-02-2016. Dr.Vijay Viswanathan, Head & Chief Diabetologist of M.V.Hospital for Diabetes interacting with CBSE school teachers to garner more information on the implementation of ‘Health Manuals’ in CBSE school in Phasse-1 of the study of ‘Chennai Slim & Fit programme’ at a press meet organized by the Institution.